I have my garden sprinkler running before the sun is on the plants out back (it's down the path on a green tripod) I feel the plants get a better watering when I do it this way vs. me trying to hand do it all. I let the sprinkler go for at least an hour so it saturates the soil nicely. I'm excited about this product this year. 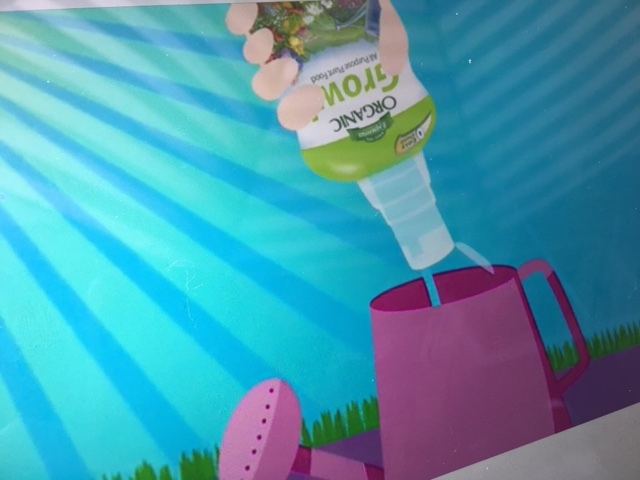 This is a liquid fertilizer by Espoma and all you do is turn the bottle over, let it empty one dose or two depending on the size of your watering can and add water. 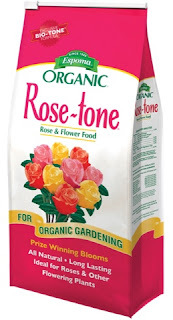 2 doses is recommended for a one gallon watering can. No fussing with scoops or measuring. I took a snapshot of their video showing how to use is. You don't even squeeze- it falls out in a pre-selected amount once you turn it over. I couldn't find it locally so I ordered it on Amazon. Their granular fertilizer is great. If you only wanted to buy one product I would buy this one. 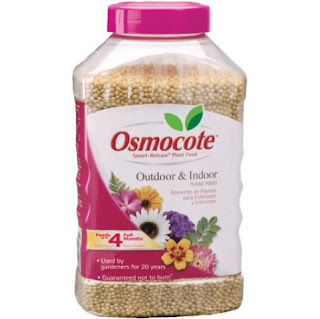 I fertilize my perennials with it. 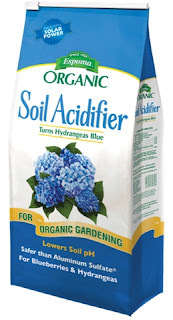 If you have hollys, hydrangeas, rhodendrons or camellias that are acid loving plants this is a great fertilizer too. This one won't adjust the color to go blue like the one below will though. I use this one on my Endless Summer hydrangeas to richen up the color and for the chance to turn the flowers more blue. I seem to get a light purple and pink most of the time. We have a very alkaline soil so it takes a bit of work to keep mine from being all pink! This is great for the perennials that flower. All of these products stay with the plant a lot longer than the liquid versions to so you don't have to fertilize repeatedly. I give my one and only rose a good dose of this and keep it well watered. Roses love water! Keeping plants healthy with some kind of fertilizing helps them resist disease and they produce a lot more plant and flower. I also put in a slow release fertilizer in the soil when I plant my annuals but annuals love love love to be fertilized. 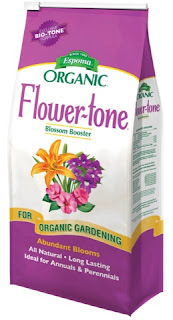 If you hate being bothered fertilizing- at least add this to your soil or any other brand you can find. 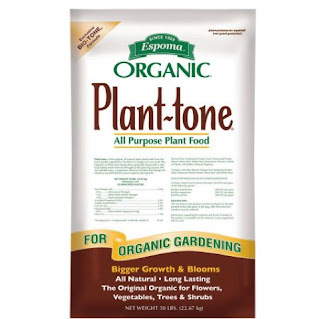 I know the potting sole often comes with fertilizer but it's really not enough to last the summer and this is a good alternative. 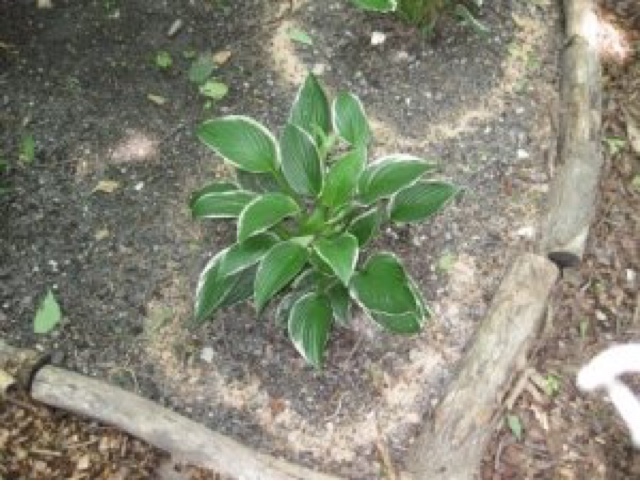 A few people have asked me about how I get my hostas to do so well. I've been incredibly lucky with them even as far as slugs go (that's what usually eats holes in them). After reading up on it- it turns out slugs don't like alkaline soil which is what I have. If you have a more acidic solid you are likely to have a lot more problems with slugs. I have been adding hardwood mulch to my beds for many years and it has broken down and created a rich organic soil which they love. I found this article by another blogger (Kevin Lee Jacobs-A Garden For the House-A Garden For the House) that you can read "How to keep slugs and snails away". 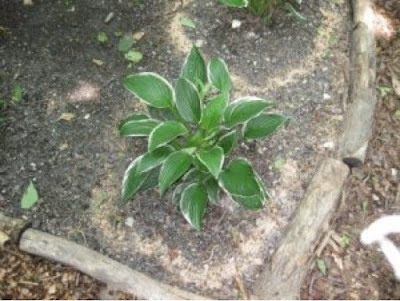 Per his advice (inexpensive way to deal with this problem) is to get a bag of lime and make circles around the plants. The slugs won't cross it. (I copied this picture from the article I mentioned above) You can even put it around tomatoes and other veges. that you might be struggling with. After I showed Dan this article he remembered his dad doing this on the farm with their vegetable garden many years ago. Some people go out in the evening and hand picked the slugs off but that could be difficult especially when you have as many hostas as I do. The best way to deal with them is to prevent them from getting on the plants in the first place. Well it was sunny but now it's darkened outside since we're about to get rained on! Wouldn't you know I just watered my flowers! Whatever brand you choose make sure you fertilize your annuals with something- it really does make a difference! Remember how fantastic they look when you bring them home- they didn't get that way with just water! Thanks for all the great info. 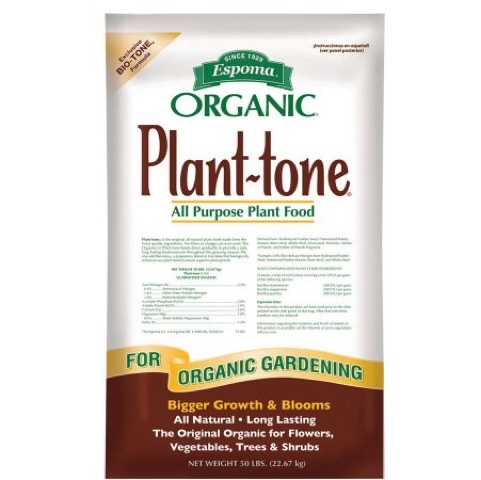 I did get a fertilizer similar to what you showed and gave all my planters a good go at it! I wish I'd seen this before I bought stuff last week. I luckily bought a similar hydrangea helper, but chose to make them pink instead of blue. Thanks! Thank you for this great advice! Your gardens are amazing. Your gardens are gorgeous. All of that fertilizer is doing it's job. Thanks for sharing your advice. you are lucky you get rain off and on. 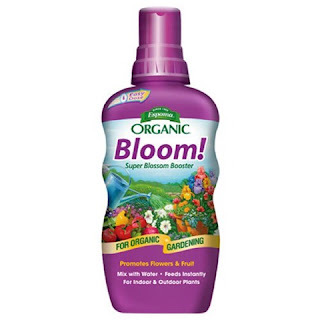 It helps keeps your plants so lush. 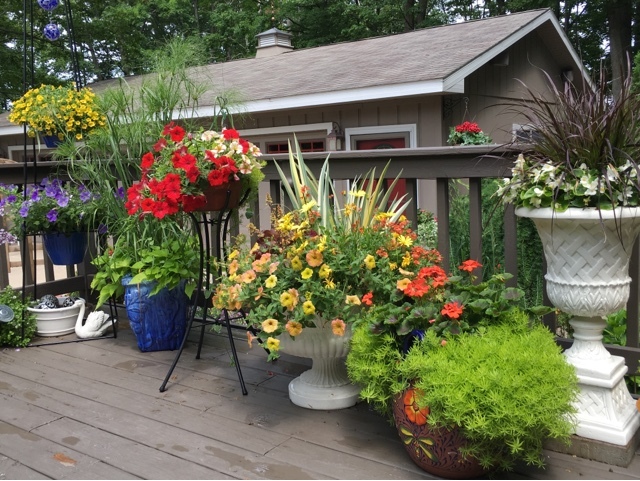 what kind of plant is the small lime green leafed thing in the terra cotta deck planter with the salmon geraniums in the middle? Hi Liz, Thanks for sharing this wonderful post filled with great advice and recommended products. This is one to file away for reference. Your gardens is incredible. OK, I'm getting the lime this weekend. Meanwhile, I got out this morning and saw the dadgum deer had chewed on one of the sweet potato vines in a pot out back. SO aggravating!!! They were merciless! This gardening thing is not for the faint of heart. Very interesting read. I love all your beautiful flowers on the deck. Great ideas Liz. Thanks for sharing all of them with us. Your flowers look so pretty. Happy Friday. Have a great weekend. Your flowers and garden are so pretty and beaming with beautiful blooms, Liz. You definitely have a green thumb! Thanks for all your tips; I am using a dry, blue fertilizer and have only used it once so far, but it has already made a difference! 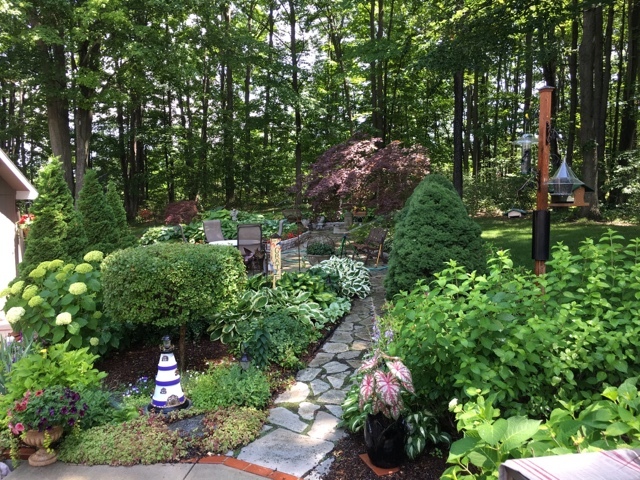 Your garden is sooooo beautiful Liz!I love how it comes alive in the Spring and is in full bloom in the summer. Thanks for the tips on the fertilizer.The liquid organic Bloom looks so easy to use! I'm hoping our Lowes has it. We still don't have anything in the backyard yet. It's still just a natural area with a Maple tree and a couple of Japanese Cedars planted by the previous owners. Wish you were close by so you could come over and give me motivation! Have a good week!